Shield Code-name: "The Incoming Tank". Backstory: Due to a failed experiment on SHEILD's project: Freelancer. Scar is given some Enhanced abilities along with a few other citizens that SHEILD put to good use, one of the many missions he took he received multiple cuts and gunshots to the neck, armor saving his life but for a cost. The bullets hit hard enough to destroy most of Scars vocal cords, SHEILD's Doctors did the best they could but they left him with scars on his Arms, neck and Hands. He is now away from SHEILD but cant stop himself from helping people in need. Now he has turned to The Avengers, so he can start doing good once more. 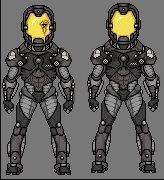 Extras (Optional): Wears Heavy Armor and barely removes it, also has a holographic companion much like JARVIS, but has his own mind. This chip is stored in the back of his head, giving him abilities a normal human could not possess. Also owns a variety of weapons.